Your elbows and other joints are taking a constant beating when you’re training hard. Your muscles might be growing and getting stronger but the joints and ligaments just can’t grow and strengthen the same way that your muscular tissue can. They can’t adapt as fast and they can’t adapt as well as muscle which is why joint and ligament injuries are so much more common than muscular injuries. If you’re training hard and putting in the hours, you’re going to experience wear and tear and there’s no way to avoid it. The only thing you can do to mitigate this damage is by warming up, stretching and wearing the proper protective gear. Many joint issues arise when people start cross-training. They might have lifted weights for years but their body isn’t quite ready and adjusted to the rigours of BJJ and wrestling and end up buckling their knees. Or it might be the other way around; they’ve been grappling for years but end up tweaking their elbow when they start lifting to increase their strength. People often injure their elbows when lifting weights. But lifting weights is a valuable and almost vital part to your training, if you take your training seriously. If you want to be a well-rounded, complete fighter then you can’t get out of resistance training. The best way, and easiest way, to protect your elbow joints when lifting is by using elbow sleeves. 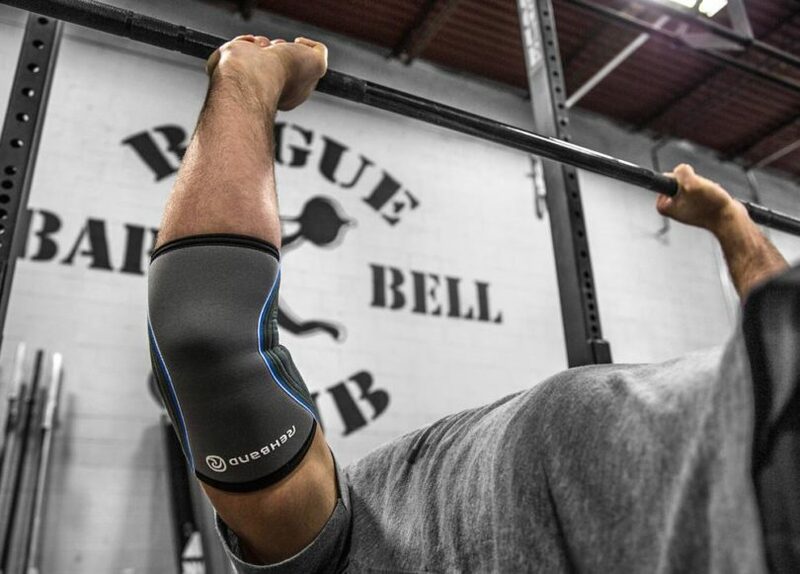 These sleeves keep your elbows warm, supple, covered and protected when lifting so the vulnerable tissue below stays safe. All of the elbow sleeves on our list are also low-profile enough to be worn when grappling, striking, etc. As the name suggests, Copper Compression use copper-infused technology in their elbow sleeves to provide superior support and offer better pain relief to the user. Copper Compression also claim that their products have a higher amount of copper infused in their sleeves than any other company and thus offer better support. The sleeve wraps tightly around your elbow without cutting off your blood flow or restricting your freedom of movement. What’s the point of using an elbow sleeve if it’s too tight and restrictive and you can’t lift or move with it? In the very unlikely event that you don’t like the product, Copper Compression offer a 100% money back guarantee with no questions asked. Normally, a person will purchase just the one elbow sleeve after they’ve already injured themselves. They’ll buy just the one sleeve to see to their injured arm and then completely leave their other arm open to injury. It is definitely better to buy a pair, like this pair from Nordic Lifting, before you need them to prevent said injury from even happening in the first place. Their stylish unisex design can be worn by both male and female trainees who wish to rehab existing issues or to prevent them from occurring. They come in multiple sizes to fit people of all shapes and sizes. No matter your arm length/width, you’ll be able to get a pair of sleeves that are both comfortable and supportive. These sleeves are lightweight, low-profile and compact, which is everything you could what you want in a pair of quality elbow sleeves. The sleeves provide the perfect amount of material to cover and protect your elbows without running all the way up and down your arms. They come in a variety sizes and the choice of colours between black and grey. Their low-profile design means that they can be comfortably worn underneath a shirt or sweater also if you wish to keep them on for long periods of time to alleviate pain. Mava sell these sleeves in a pair and promise to give you freedom from elbow pain and discomfort. Wearing these elbow braces from Crucial Compression will give you instant pain relief from any existing elbow injuries you may have as well as providing stability and support to prevent such injuries from happening. It’s also nice to have that added confidence that comes with wearing protective gear when attempting new feats such as personal bests on the bench press or deadlift. The material is lightweight and breathable to keep you as comfortable and sweat-free as you can be when training hard. This same lightweight material and ergonomic fit allows you to be adequately supported without cutting off circulation to your hands and fingers. This moisture-wicking, breathable technology is especially important if you plan to wear these under your normal clothes throughout the day. You may have tried compression sleeves for your elbow or your knees before and have been dissatisfied; too thick and bulky to be worn under normal clothes, too baggy and has to constantly be pulled up and readjusted, so hot that it makes you sweat buckets, and so on. With Quantro compression sleeves, you will have none of the above problems. With Quantro, you will have a lightweight, low-profile sleeve that can be worn under a dress shirt without anyone even knowing it’s there. Their sleeves are thin and compact enough to be worn without becoming too hot and causing irritation. All whilst providing you with that vital support and pain relief that you seek. The Quantro sleeve is a great first purchase for someone who is still a bit undecided on whether to use sleeves or not. Whether you have elbow injuries or not, elbow sleeves can prove vital. If you’re training hard on the mats and lifting hard in the gym, you’re going to want to do absolutely everything you can do to prevent any injuries, problems or general discomfort. Elbow sleeves are an effortless way to do such a thing. With the above sleeves, you can put them on and you won’t even know they’re there, as you start lifting harder and heavier than you have ever done before.